The Philips HL1643/06 Mixer Grinder with 5 Jars can be truly branded as the silent mixer and grinder, and there are plenty of reasons accrued to its silent operations. First of course are the smooth and fine edges stainless steel blades which make mixing and grinding a totally refined process. The presence of lift and grind blade action, every action is transformed into smoothing activity. This Mixer Grinder with 5 Jars comes packed with Chutney Jar, Grinding Jar, and Liquidizing Jar, besides two other general purpose jars. Whether you have your little one sleeping at home or your loved ones taking a quick nap, this super silent Philips mixer grinder lets you make your favourite dishes blending all the ingredients perfectly making no sound. The Philips mixer grinder is designed with a powerful motor that makes blending faster and easier while performing with minimal sound. The appliance sports a sturdy body along with stainless steel knives to last longer. The mixer comes with a 3-speed setting for better flexibility while blending and grinding. The mixer is designed with Quadra Flow jars that prevets the food particles from sticking to the sides of the jar. 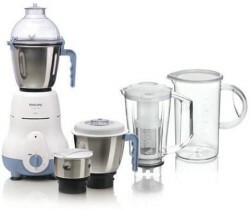 The appliance comes with a 0.3 liter chutney jar, 1.5 liter wet grinding jar, a 1 liter multi-purpose jar along with a blender volume capacity of 1 liter. 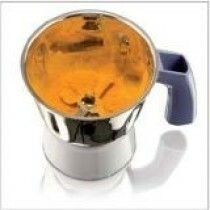 The Philips mixer consumes around 600 watts of power for efficient functioning. The appliance comes with an automatic shut-off feature that turns off the mixer when over loaded. The non-slip feet makes sure the mixer doesn't slide off the kitchen counter to prevent accidents.